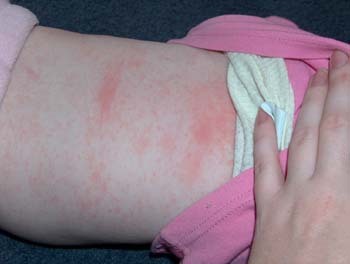 The day after her temperature dropped she broke out in a rash. I assumed it was just heat rash. 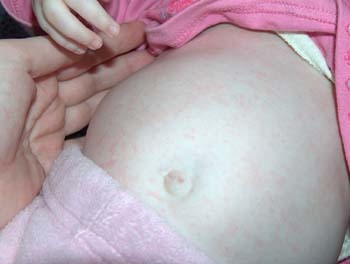 The jury is still out on what exactelly it is but there is the possibility it could be measles/baby measles. She still drinks plenty and is relitively happy. All I have to do is keep her cool and watch her spots. Jadeen had baby measles when she was just a baby and a doctor mis-diagnosed it then (not our normal doctor) and prescribed cortizone cream for her. This diagnosis did not satisfy me, so the very next day I headed to our normal doctor (30mins drive away) to find out she has baby measles and all we can do is keep up her fluids and keep her cool. Needless to say, I have not been back to that doctor regardless of what is wrong with the kids. This was 5 years ago. Anyhow, here are the spots. Judge for yourself if you want.